Over the last decades, the impressive advances in the control and manipulation of atomic de Broglie waves by coherent light pulses had led to the emergence of highly sensitive atomic interferometers. Atom interferometry is based on coherent splitting and recombination of atomic wave packets. The sensitivity of an atomic interferometer is proportional to the spatial separation of the wave packets and could be enhanced either by increasing the interaction time or by enhancing the momentum transferred by the light onto the atoms. Furthermore relevant ideas has been proposed to improve the accuracy of such technique by implementing differential schemes, in order to get rid of many systematics and noise sources that could efficiently rejected as common-mode effects. 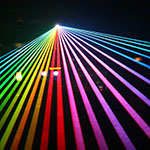 – Why and how a large momentum beam splitter will enhance the sensitivity of atom interferometer.